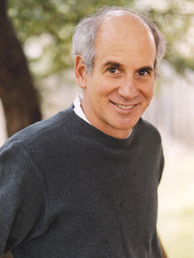 Newbery Award–winning author Louis Sachar is the creator of the entertaining Marvin Redpost books as well as the much-loved There’s a Boy in the Girls’ Bathroom, winner of 17 child-voted state awards. Louis Sachar’s book Holes, winner of the 1999 Newbery Medal, the National Book Award, and the Boston Globe–Horn Book Award, is also an ALA Best Book for Young Adults, an ALA Quick Pick, an ALA Notable Book, and was made into a major motion picture. Sachar graduated from UC Berkeley in 1976 with a degree in Economics, and began working on Sideways Stories From Wayside School, a children's book set at an elementary school with supernatural elements. Although the book's students were named after children from Hillside and there is a presumably autobiographical character named "Louis the Yard Teacher," Sachar has said that he draws very little from personal experience, explaining that "....my personal experiences are kind of boring. I have to make up what I put in my books." Sachar wrote the book at night over the course of nine months, during which he worked during the day in a Connecticut sweater warehouse. After being fired from the warehouse, Sachar decided to go to law school, around which time Sideways Stories From Wayside School was accepted for publication. The book was released in 1978; though it was not widely distributed and subsequently did not sell very well, Sachar began to accumulate a fan base among young readers. Sachar graduated from University of California, Hastings College of the Law in 1980 and did part-time legal work while continuing to write children's books. By 1989, his books were selling well enough that Sachar was able to begin writing full-time. Sachar married Carla Askew, an elementary school counselor, in 1985. They live in Austin, Texas, and have a daughter, Sherre, born January 19, 1987. Sachar has mentioned both his wife and daughter in his books; Carla was the inspiration for the counselor in There's a Boy in the Girls' Bathroom (1988), and Stanley's lawyer in Holes. When asked about whether he thought children have changed over the years, Sachar responded: "I've actually been writing since 1976, and my first book is still in print and doing very well. ... I don't think kids have changed." Click here to read my review of Holes. If I answered this at a different time or day, I probably would have chosen three others. Maybe ten hours writing. Some weeks very little reading. Others, quite a bit. During my last year of college, for an easy 3 units, I signed up to be a teacher's aide at a nearby elementary school. It turned out to be my favorite class. I loved being with the kids. When I graduated, I decided to try writing a book about the kids I knew there. That became Sideways Stories From Wayside School. I mailed the manuscript to ten different publishers. One accepted it. I think writers mostly teach themselves. It takes a lot of perseverance and a love of literature. I suppose writers are born with certain qualities that, if exposed to good writing, would choose to pursue it for themselves. The freedom to let a story take me places I never expected; the way characters become real to me. Least favorite thing? The isolation. I have worked on plays and a movie, and I enjoyed the collaboration with other talented people. I don't have that when writing novels. Yes, I enjoy working with an editor but it's not the same thing. Don't expect too much from yourself. The first draft is always awful. The fun part is after the first draft is written, when you begin the process of turning it into something. My second drafts are also awful. It's not until I get to the third or fourth draft of a book that I start to think it might be good. Kazuo Ishaguro. He's always been one of my favorite writers, and I am thrilled that he just won the Nobel Prize. I love Louis Sachar's books, from Sideways Stories to Fuzzy Mud. Thanks for the interview!